Tribesmen stand on the rubble of a building destroyed by a U.S. drone strike in the southeastern Yemeni province of Shabwa. Abdulrahman al-Awlaki, the 16-year-old son of slain U.S.-born cleric Anwar al-Awlaki, and six al Qaeda militants, were killed in a strike on this building on Oct. 14, 2011, tribal elders said. The former top lawyer for the Pentagon said Thursday that any official involved in counterterrorism should have a “heavy heart” after reading a grandfather’s moving account of the inadvertent killing of his grandson in a U.S. drone strike. 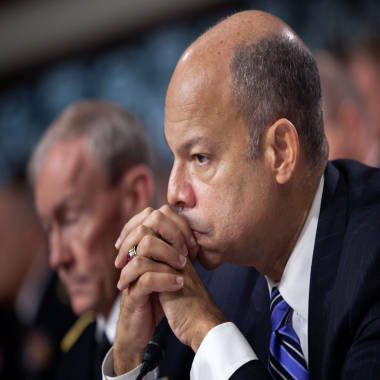 Jeh Johnson, who served as general counsel of the Defense Department until last year, reacted strongly to a New York Times op-ed published Thursday about the slaying of 16-year-old Abdulrahman al-Awlaki, an American citizen. In the op-ed, the boy’s grandfather, Nasser al-Awlaki, described him as a “typical teenager” who watched "The Simpsons," listened to Snoop Dogg, read Harry Potter and was on his way to find his father when he was killed by a U.S. drone strike. Speaking on a panel at the Aspen Security Forum, an annual gathering on national security issues, Johnson described his reaction to the piece. “The point I want to make is that for any responsible official of our government involved in counterterrorism, and there are number of you in this room, you read an op-ed like that and you get a pit in your stomach, and you read it with a heavy heart,” he said. “And if you don't, you should not be involved in these decisions." Jeh Johnson, former general counsel for the Defense Department, is shown at a hearing of the Senate Armed Services hearing on Nov. 10, 2011. The op-ed was the subject of discussion among those attending the conference, but Johnson, who oversaw legal approvals for military drone strikes at the time of the younger Al-Awlaki’s death, was the highest ranking official to speak out on the issue. Attorney General Eric Holder, in a letter to Congress last May, acknowledged that a drone strike had inadvertently killed the younger Awlaki – one of four Americans slain in drone attacks. The only one of the four who was specifically targeted was the boy’s father, Anwar Al-Awlaki, according to Holder’s letter. Holder identified the other two American victims as Samir Khan, who ran al Qaeda’s web-based propaganda magazine Inspire, and Jude Kenan Mohammed of Raleigh, N.C., who reportedly was killed in Pakistan in 2011. In the op-ed, Nasser Al-Awlaki said he planned to petition a federal court to hold U.S. officials responsible for the drone strike.